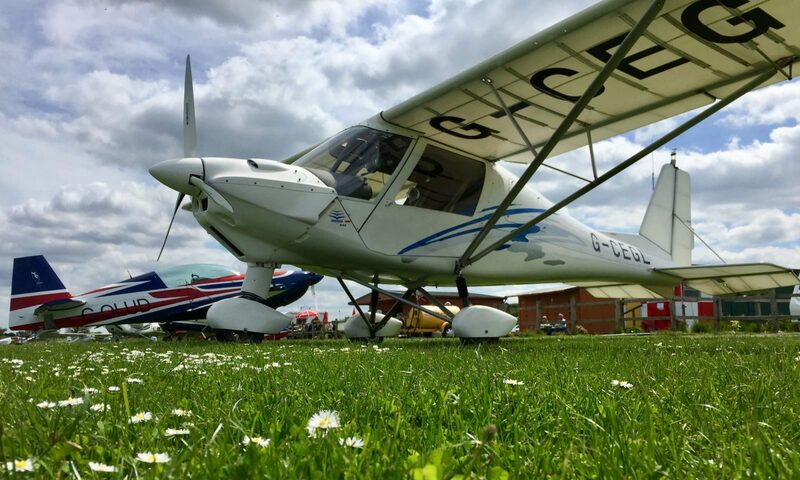 The day of my first microlight flight arrived (18 July 2013) so around an hour beforehand I set off to Chatteris, feeling both excited and nervous. I arrived at the club and met Mike & Katie, Mike discussed what we would be doing. The first lesson is normally flight familiarisation, but as I had had a 60 minute lesson in a Piper not long ago it was decided we would go straight to lessons 4,5 and 6 Effects of controls, Taxiing and Straight and level respectively. Mike spoke about each control and how they worked and then we went out to the C42 and looked at the control surfaces and the construction of the airplane. The C42 has a large aluminum tube running the length of the airplane and all the main structures bolt back to this tube as does the engine, a Rotax 912s 80bhp. The body is fiberglass and wing and tail plane are aluminum frames covered in GT-foil. It doesn’t have the traditional yoke, instead it has a center mounted stick to control the ailerons and elevator, attached to the stick is a leaver which controls the brakes and three buttons which are elevator trim up and down and push to talk button for the radio. We taxied out to the runway and Mike took us up, it seemed to only require a very short amount of time before we were airborne and climbing high into the sky. We leveled off at around 4,000ft where Mike demonstrated the effect of each control in turn, and then the bit I was waiting for I got to have a go!!! I have a tendency to watch the flight instruments which makes it hard to keep it flying straight and level as you are always reacting to an event that has already happened, Mike soon saw this and got me looking to the horizon and things improved. The landing was interesting as the microlights come in to land a lot steeper then light airplanes such as the piper, so the ground appears to rush up to meet you the first time you land in one. Somehow flying in a small light airplane seems safer than the larger commercial jets, I guess it’s because you can actually feel the microlight flying, it’s difficult to put in to words, take a trial lesson and you will know what I mean! This is a fascinating insight into the world of a beginner and the journey you have taken to get to this stage. I cannot quite grasp the concept that such a small plane would feel safer when flying than a large commercial jet, the only way I am able to rationalise this in my head is that it is because you are in control of the aircraft. I guess as you state in your closing paragraph, I should take a trial lesson to fully understand the point. I hope everything goes well for you in the future Adrian and good luck in securing that private pilots licence!